This regal waterfront estate sits on sloping terraced lot with beautiful views of Shuswap Lake. Starting at the top of the property you will find a triple car garage with a one bedroom fully contained Carriage House with covered deck. Adjacent to the garage area is room for RV parking with hook ups. 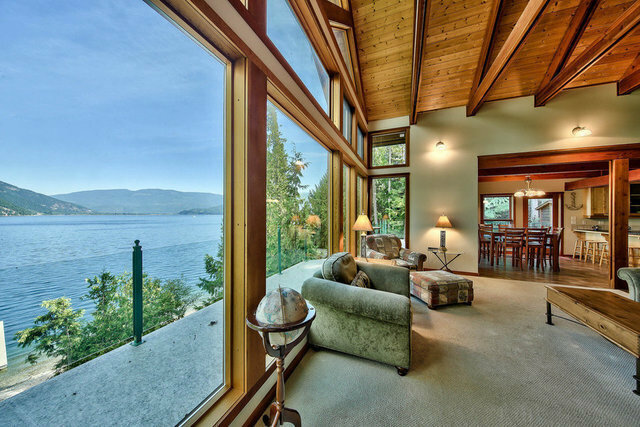 The second level leads you to the focal point of this estate, being the custom built timber frame home that is approximately 3600 square feet with generous sized rooms and floor to ceiling windows capturing the beauty of the lake and surrounding mountains. The large kitchen features, maple cabinets and newer stainless steel appliances with easy access to the dining room and outdoor living area. Two bedrooms on the main floor, including a master bedroom over looking the lake with doors to the wrap around sun deck. Upstairs is a loft area that is ideal as an extra bedroom or home office. The basement features a large family room, with a roughed in wet bar area, two additional bedrooms, bathroom, laundry room, storage and mechanical room. The basement steps out to a covered patio area with a hot tub over looking the lake. Take a flight of stairs or a gravel path (suitable for ATVs too) down to the lower lawn and 99&apos; of beach area where there is an adorable Cabana built to keep your beach beverages or snacks close by. No expense has been spared on the landscaping with the rock retaining walls, automatic irrigation, carefully planted trees and shrubs to blend into the natural environment. Sicamous is a 10 minute boat ride away and Salmon Arm is approximately a 35 minute drive. Additional photos and video on shuswapcollection.com. All measurements are approximate. Buyer to verify any measurements or information deemed of importance.